The forepeak has always been a key design element in our designs (both sail and power), and this continues with the FPB 64. Although there are systems in this area, the key function of the forepeak is storage. Drop down the ladder with us and we will take you on a tour. These photos do not do justice to the space in the forepeak, so you will need to add a dose of imagination. We are looking here from the area under the access hatch forward. 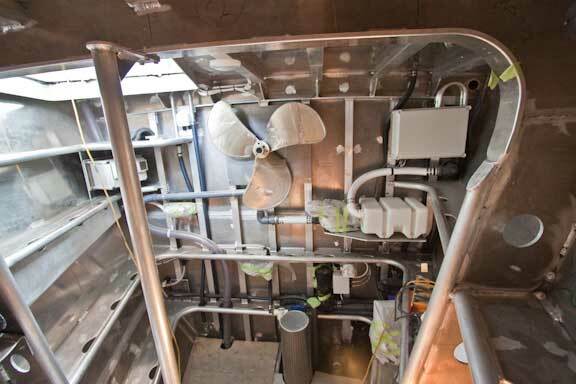 The opening in the bulkhead is the chain locker (the Maxwell V4000 windlass gearbox and motor can be seen just forward of the opening. 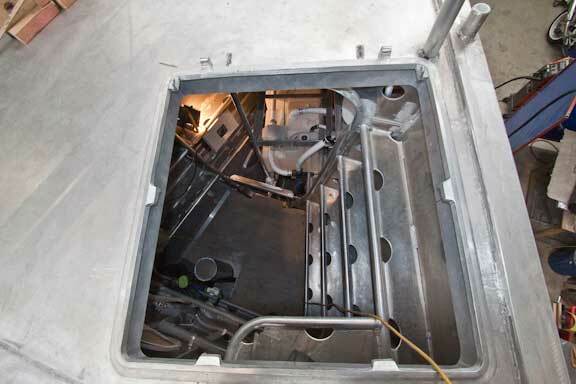 The forward end of the self draining chain locker is the aft side of the collision bulkhead. The tank is for the Vacuflush toilet (the head is located in the Owner’s suite). The aluminum framework above the tank is for a storage shelf. Turning the camera around here and looking aft, you can get a sense for the space. The topside stiffeners are designed to be used for storage and tying too. It will be easy to add shelves as requirements dictate. The large diameter pipe is for a sonar hoist. The spare prop is temporarily positioned on the bulkhead. There is a substantial amount of volume below the sole. 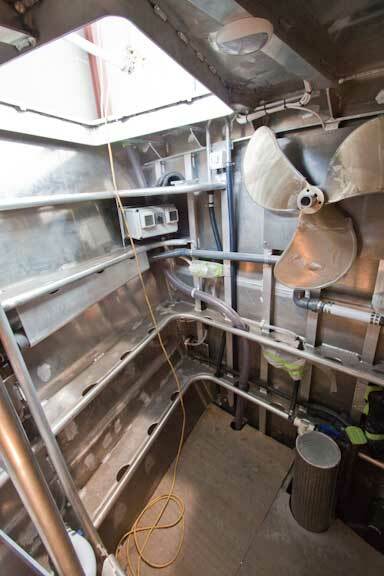 This area will be good for bulk cordage, deflated fenders, and perhaps parts of the big spare anchor if it is not stored assembled. The forepeak volume looks huge (some would say wasted). 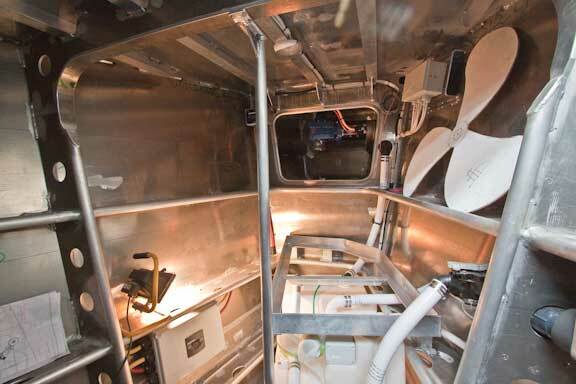 But by the time it is filled with fenders, two sets (or more) of dock lines, towing warps, drogues and para anchors, oars, awnings, dive gear, and a myriad of other items the FPB 64 Owners will love this space. There is room for an organized cruising yacht load of miscellaneous gear. Having become accustomed to this space over the last 30 years we cannot see how others do without it (but if you really see this as “wasted” there is room here for a crew or grandchildren’s cabin). To see the first two reports in this series click here. This entry was posted on Monday, November 23rd, 2009 at 9:00 am and is filed under FPB 64 Updates. Both comments and pings are currently closed. add an awning over the hatch and a couple of hamocks and it’s already a childs cabin! I’ve never had a metal boat so forgive my ignorance. Is the steel anchor chain resting on the aluminum hull a concern or do you find the zinc on the chain provides enough protection? Do you have a coating system of some kind in the chain locker? If so what do you use? I’m guessing an elastomeric polyurethane would be great. Overkill / Unnecessary? Do you have any shots of the basement with all of its systems and such? I’m very eager to see any refinements you’ve made in there since Windhorse, as well as see how the space compares for storage in the smaller boat. Love your work! Thanks for sharing the build process with us! The zinc coating (galvanizing) works as an anode in the chain locker, so no paint system is required (nor desirable). Also, steel and aluminum are not that reactive (compared to what happens with stainless). We have used this approach now for almost 30 years. The basement area is particularly difficult to photograph during construction. It will probably be end of January before we have a set of images.